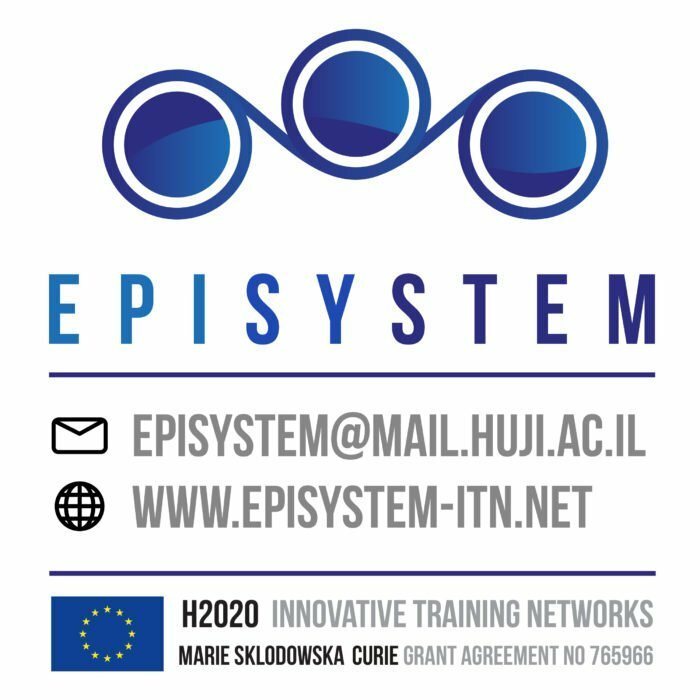 The workshop will provide the ESRs with basic bioinformatic tools and concentrate on the analysis of epigenetics-related datasets, including (a) DNA mehylation and hydroxymethylationanalysis, (b) ChIP-seq and RNA-seq analysis (c) Mathematical modelling techniques in epigenomics in health and disease. To be hosted by Helmholz Centrum . The workshop will be organised by Torres-Padilla, who also organised two previous meetings of the series in Strasbourg together with Abcam (2012, 2014). Main topics will include (a) Epigenomics and single cell approaches (b) histone, RNA and DNA modifications (c) Epigenetic phenomena (d) Reprogramming and stem cells. To be hosted by Hubrecht Institute and Radboud University, the Netherlands. The workshop will be constructed of two parts: (a) Cutting-edge single cell technologies for transcriptomics and epigenomics focusing on DNA methylation and hydroxymethylation, (b) State-of-the-art proteomics technologies, focusing on methods which could be readily implemented in the ESRs’ research. To be hosted by The University of Milan, Italy. The Workshop will include hands-on experimental work; discuss aspects of (a) reprogramming techniques, (b) chromatin remodelling and iPS cells. 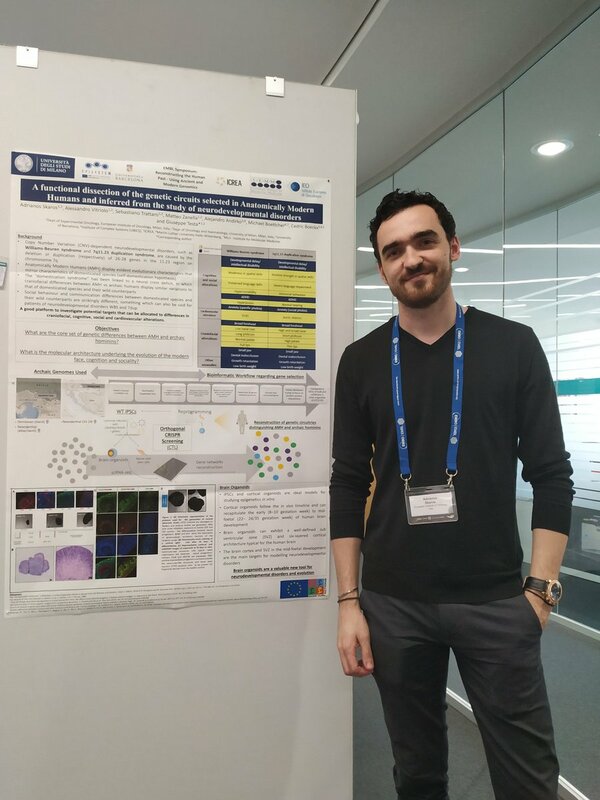 (c) The fundamental principles of reprogramming cells to pluripotency and the power of modelling neurological diseases using pluripotent models. Supplementary session: Ethical issues in reprogramming. To be hosted by KadimaStem, Israel. The workshop will focus on the major aspects of stem cell research: (a) advanced methods of differentiation (b) stem cell drug screen platform technologies (c) regenerative medicine. A special session will be dedicated to the pharmaceutical industry, trends and directions. • Training conducted by a professional organisational consultant. To be held at the University of Milan, Italy and organised by Meshorer, Testa and Almouzni. It will focus on the variety of the topics investigated by EpiSyStem network. The conference will open its doors not only to all ESRs, Network partners and members of the supervisory board, but will bring additional internationally acclaimed experts to present their science and engage in active discussions with the students. Applications from international students in the field of stem cell epigenetics will also be encouraged and “flash talks” / “elevator pitch” techniques will enable short presentations of posters. Activities such as ‘Meet the expert lunch’, meetings with journal editors, industry representatives, as well as group discussions will be held during this conference. To be given at Institut Curie and co-organised by EpiSyStem member Almouzni – a past organiser of the Spetses Summer School. Quantitative approaches and theoretical models (f) Maintenance of epigenome integrity (g) Epigenetics and cancers. In addition, a round table career development workshop will be held on the last day, involving contact with industrial parties and information to various career tracks. An annual Summer School at the Hebrew University of Jerusalem reaching now its 23rd year. The school is organised by EpiSyStem SAB member and Nobel Laureate Prof. Roger Kornberg (Stanford) and co-organised by Meshorer. The Summer School deals with different aspects of chromatin, nuclear dynamics and Eukaryotic transcription. This School will be open to and will hold seats for all EpiSyStem’s ESRs. To be hosted by Diagenode, Belgium. The workshop will focus on epigenetic research in the industry. Main topics will cover (a) production and validation of ChIP-grade antibodies and reagents (b) epigenetics related technologies (c) entrepreneurship and the emerging epigenetic industry. Supplementary session: Intellectual property management in academia and industry. 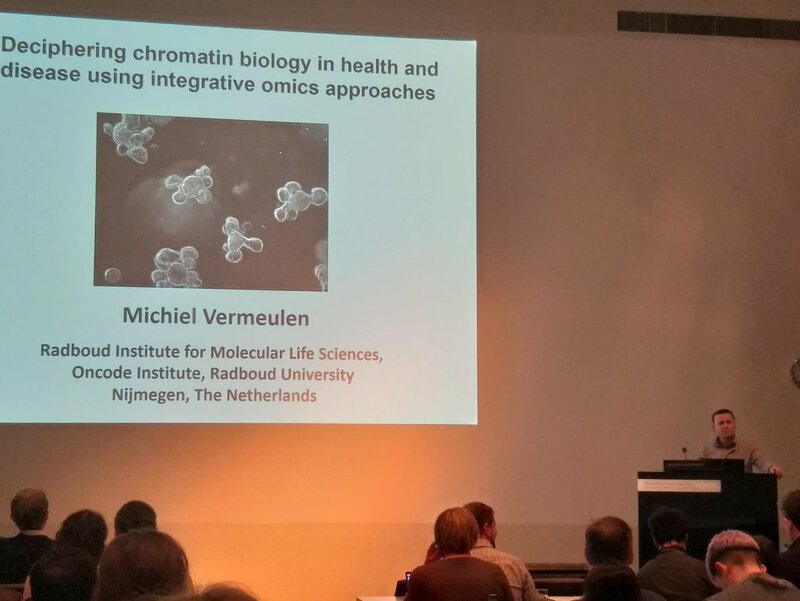 Michiel Vermeulen on stage, discussing the opportunities of integrative multi-omics approaches in stem-cell fate research. We also were hosted by Magdalena Gotz and Jovica Ninkovic at LMU Munich where we learnt more about adult neurogenesis and brain repair. We also had the opportunity to see how they perform two-photon microscopy on zebrafish and isolate mouse embryonic cerebral cortex. On our last day, we were hosted by Maria Elena Torres Padilla @epigeneticsHMGU where we learnt more about totipotency. We were so fascinated when we watched Maria perform microinjections in 2-cell mouse embryos! EpiSyStem is comprised of 8 leading academic partners and 2 professional industrial partners. The Network combines chromatin biology in stem cells, early embryos and reprogramming, including the modelling of human neurological, chromatin-related diseases with bioinformatics, epigenetics / epigenomics, and systems biology at the population and single cell / single embryo level. This multidisciplinary approach enables profound training and deep, systems-level understanding of chromatin biology and epigenetic regulation of stem cells, differentiation and reprogramming, with a strong support by industrial partners.